Overview of Pepco’s Capital Grid Project | Park View, D.C. Diagram showing existing (green) and new (yellow) substations that will be involved in Pepco’s Capital Grid Project. On the evening of May 1st, Pepco hosted Ward 1 Advisory Neighborhood Commissioners to brief them on their upcoming Capital Grid Project. The project’s goal is to build an underground transmission route through the District from the north to the south. This is necessary to create multiple pathways of power supply to connect multiple substations in the Capital area with higher electrical load capacity. In short, this creates a “networked system” that improves reliability and resiliency. The underground transmission lines will be constructed from the Takoma Substation in Prince George’s County through the District to the Waterfront Substation. 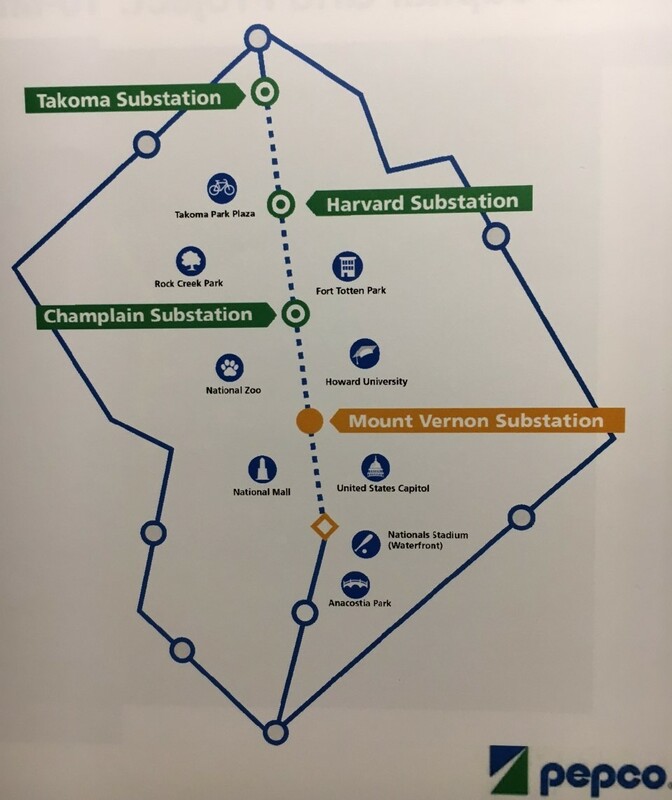 The feeders will travel approximately 10 miles, connecting five substations: Takoma, Harvard, Champlain, Mount Vernon (proposed) and Waterfront. The flexibility this will create will support faster service restoration and reduce the potential impact of major unforeseen event. In our area, work will begin around Fall 2018/Winter 2019 in the area of New Hampshire and Georgia avenues and move south along Georgia Avenue through the Spring/Summer of 2019. On Georgia Avenue, the scope of work will close two of the four lanes as new transmission cables are put underground via trenching. Each night steel plates will cover the trenches. Work will continue down Georgia to Harvard or Gresham, before turning west to the Harvard Street substation. The Havard Street Substation will also be upgraded and expanded as part of this project, with work commencing as early as 2019 and estimated to be completed around 2022 or 2023. I will continue to share more information about the construction aspect of this project as we get nearer to the start date. Pepco will also be sharing information directly to the community. This entry was posted on May 2, 2017 at 7:01 am and is filed under Development, Engineering, Pepco. You can subscribe via RSS 2.0 feed to this post's comments.